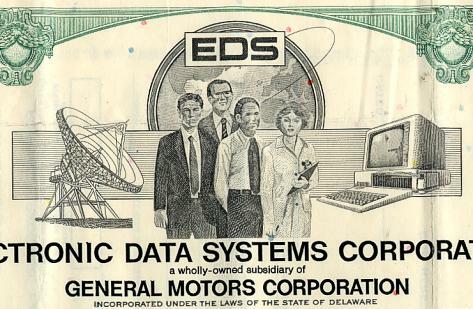 Beautiful certificate from the Electronic Data Systems Corporation issued in 1992. This historic document was printed by Security-Columbian Banknote Company and has an ornate border around it with vignettes of three men and a woman standing together, a satellite, a computer, and a globe. This item has the printed signature of the company�s Chairman of the Board, Roger Smith and is over 15 years old. 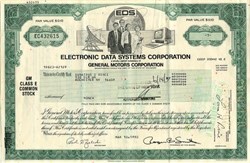 In 1962 Perot founded the company Electronic Data Systems. Today, EDS is a multi-billion dollar corporation employing more than 70,000 people. When two EDS employees were taken hostage by the Iranian government in 1979, Perot directed a successful rescue mission composed of EDS employees and led by Colonel Arthur 'Bull' Simons. Perot personally went into Iran and inside the prison where his associates were held. Noted author, Ken Follett, write a best selling novel, On Wings of Eagles, about the rescue. An NBC TV miniseries was later made about this event. Company Profile EDS is a professional services firm that applies consulting, information and technology in innovative and productive ways to enable clients to improve their overall performance, extend their enterprise ahead of the competition and better serve their customers. The company's end-to-end services portfolio covers these areas -- Management Consulting, E.solutions, Business Process Management and Information Solutions. Each of these areas has tremendous growth potential, and each contains a wide assortment of related service offerings. EDS is highly innovative in using technology to solve business problems and help clients in such areas as improving customer service, enhancing the quality of their products and even getting to market ahead of the competition. EDS is constantly looking for ways for it and its clients to be more competitive. EDS is a recognized global leader in providing E-business and information technology services to 9,000 business and government clients in approximately 55 countries around the world. Having founded the information technology (IT) services industry more than 35 years ago, EDS delivers high value management consulting, electronic business solutions, business process management, and systems and technology expertise to help clients simplify complexity and achieve superior value in the digital economy. The company has more than 121,000 employees worldwide and brings deep industry practice knowledge to solve challenges in a wide variety of industries, including communications, energy and chemicals, financial services, government, healthcare, products and retailing, and travel and transportation. EDS stock trades on the New York Stock Exchange and the London Stock Exchange under the symbol EDS. The company is very strong financially: It registered revenues of $18.53 billion in 1999 and signed new contracts in 1999 valued at more than $24.9 billion. EDS has a "backlog" of client commitments of more than $60 billion and has a robust pipeline of new-business opportunities. EDS is committed to being a great place to work, a trusted business partner and an attractive investment.